At the very sensible suggestion of Felix, I am taking it easy here in Luxu. There is no huge hurry to get into Shanghai, so I’m spending some quality time here chilling out with natives. Native English speakers that is. 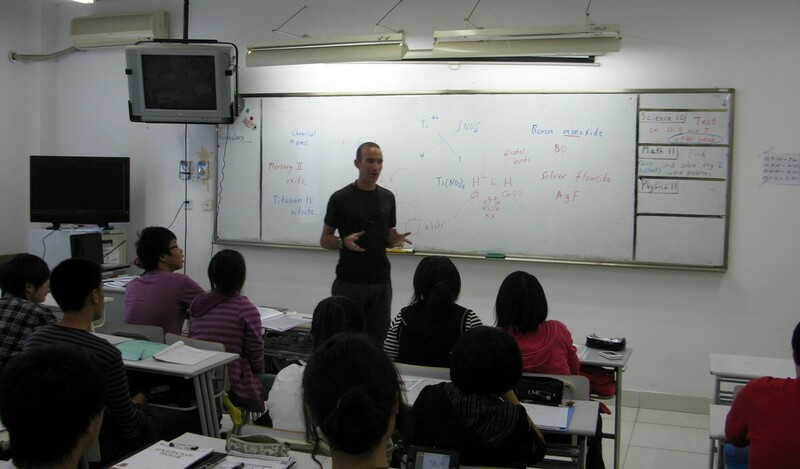 Yesterday I visited the Sino-Canadian school and spoke to four classes of high school students about my journey. 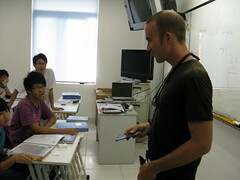 They were short sessions of about 15 minutes, but the students seemed to enjoy it. 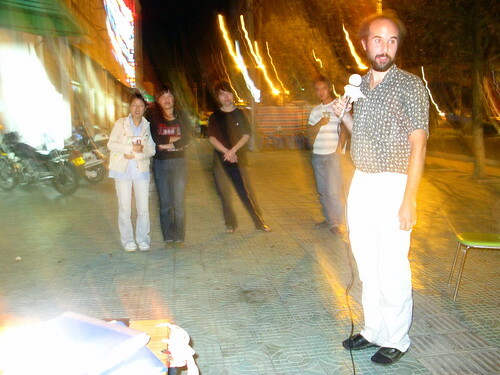 In the evening Steve, Felix and I rocked the town with some street-side karaoke…well…Steve did grandly. He was the only one who could sing any Chinese songs. The current plan is to skate into Shanghai to the central People’s Square tomorrow. The weather has cooled off, so I am looking forward to the last day’s skate. The original idea was do the trip within 14 degrees latitude. How many will it end up as? Holy Cow! Dude! Did you really say "last day's skate"? That seems impossible. How could that be? You must be feeling strange right now, but I guess relieved is a big emotion, too. The hassles of China seem almost overwhelming from over here in the USA. I'm glad you're not quite done, yet, and that we get to follow along on your final bike leg of the journey in Kiwi Land. I recently read a book by Kira Silak. She canoed 600 miles down the Niger River to Timbukthu. According to her 'you do not choose a journey, a journey choses you and a journey will tell you when it is over.' It seems that your journey ahs spoken to you. The re-adjustment is going to take. At the same time it seems another journey 'has choosen you'. One day you will look back and realise that the cliche 'Even the bad times were good' is very true. In the mean time I will re-read your epic journey, seeing that Mrkus is also off-line for a while. 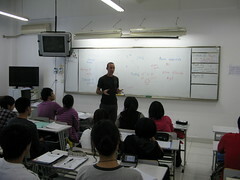 Glad to see you enjoyed it here in Luxu, and thanks again for speaking to my classes. Hope your final skate goes well. Maybe I'll see you again on the highway as I have to pick up my bike in Jinze tomorrow and bring it into Qingpu for some test commuting. Almost home! How exciting. I'm really looking forward to seeing you again. I won't be able to make it to Auckland either, but I hope we can catch up soon as when you get to good old Chch. Wow! That must feel so strange thinking that you are there at last! No more pressure and having to push yourself to the enth degree.